January 2019 till December 2019 Satya Narayan Puja and Ganesh Chathurthi Puja Monthly. 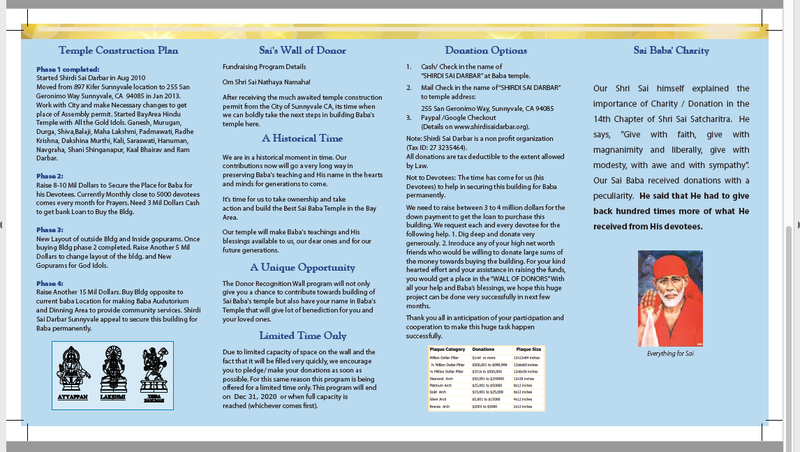 Satyanarayana Pooja suggested donation $31 , All puja items will be proved , signup sheets available in the temple. All Music Schools Teachers/Individual Performer. September 12, Wednesday -23 Sunday , 2018. Special Puja everyday Evening 7pm. Need Min 108-200 Ladies signup required. Puja Cost Free. Nov 7th Wednesday 2018. 7pm. Sita Rama Kalyanam Festival Celebration coming up April 8 Saturday, 10am - 1:00pm.Kanya Dhaanam ,Kankana Dhaaranam,Mangalya Dhaaranam,Mangala Arathi,Prasadam for all. All families , please come in Traditional Indian wedding Dress. if you are going to bring any one the above items. If you want to sponsor food suggested donation $1001 If you want to sponsor complete Puja, talk to priest Bala and suggested Donation per family $251. 255 San Geronimo Way Sunnyvale CA. It's a personal to each and everyone to come and take divine blessings of Baba and Enjoy Baba Bhajans,Baba Palki and Sai Bhandara in the evening. Maha Shiv Ratri Maha Utsav coming up Feb 24 Friday 6am -Feb 25 Saturday 6pm (24 Hrs Shiva Abhishek) All Night Bhajan and Kirtan, Special Shiva Aarthi Every 4 hrs. Rudram Chanting. Please volunteer 2-3 hrs, if you can to help us out in this event.we are looking help. you are welcome to bring Flowers,Mala, Prasad, As per your convenient Time for offernings. We Need Help in Singing bhajans Feb 24 Night . Temple will be open Feb 24 Night for everyone. Priest Will be available for All Puja's. Basant Panchami Celebration Feb 1st Wednesday with Saraswati Puja 7pm Energized Picture of Maa Saraswati will be given to everyone. Saraswati Puja and Yagna for Education,Knowledge,Music and soft spoken Suggested Donation $31 please bring Kids with school books. As part of this event, Bay Area Hindu Temple Part of SSD will perform Sani Japam, Sani Taila Abhishishekam , Sani moola mantra Homam on behalf of these below Rasi people...Need participation from people with the following Rasis vruschika, dhanassu, makara, vrushaba, mithuna ,kanya Rasi . Good for the rasis Vruschika, Dhanassu, Makara, Vrushaba, Mithuna, Kanya. Please bring fruits, flowers, one sesame oil bottle, blue blouse piece. Shirdi Sai Darbar Located at 255 San Geronimo Way Sunnyvale is Celebrating New Year 2017 by doing Sai Palki ,Sai Ram Chanting & Sai Bhandara (Sai MahaPrasadam) On Jan 1st Sunday from 9.00 AM to 9.00 PM. Dec 31st Saturday 2016 - 9:30 PM – 11:30 PM (Mid Night) : Sai Namawali ,Sai Mahima, Sai Naam Japa, Sai Dhyan Reading Sai Sat charitra book chapter and Shirdi Sai Bhajans. KarthikaAll Monday Somavara-SHIVA RudraAbhishek, Alankar, Puja, BilvaPatra Abhishek and Archana. Please Bring Prasad,freshflowers,Malafor offering to God. 07:05 p.m : Sai Satcharitra Parayana of Chapter 43 & 44. 07:55 p.m : Shirdi Sai Baba Bhajans. 08:30 p.m : Shirdi Sai Baba Palki Procession. Akhand Ramayan celebration Oct 1st Saturday and Oct 2nd Sunday at 255 San Geronimo Way Sunnyvale ca 94085 . This is a personal invitation to all devotees of bay area and beyond to come and celebrate. Sai baba 24 Hrs Akhand Ramayana Event on Oct1st and oct 2nd. All Devotees are requested to come and participate in Reading Akhand Ramayana from oct 1st Saturday and oct 2nd Sunday. 24 Hrs. Ramayan Parayan (Akhand Ramayana) will start on Oct 1st Saturday Morning 10.00 am till Next Day Oct 2nd Sunday 12 Noon followed by Maha Naivedyam Prasad. We are looking for more devotees that can lead the parayan of Ramayan. Can you please either volunteer or pass on the message to your other family members and friends so that we can get this conducted smoothly? Looking forward to hearing from you. Even one hour would help. 255 San Geronimo Way Sunnyvale Ca 94085. Shirdi Sai Darbar Located at 255 San Geronimo Way Sunnyvale is celebrating New Year function by doingSai Bhandara (Sai MahaPrasadam) On Jan 1st Friday from 9.00 AM to 9.00 PM. Devotees can also bring Prasad and offer to baba on Friday Jan 1st , 2016 from 7:00 AM to 8:25 PM and take Baba’s blessings on New Year. 10:00 PM – 12:00 AM (Mid Night) : Sai Namawali ,Sai Mahima and Shirdi Sai Bhajans. Calendar Distribution ( From 9 AM to 9 PM ) :- Volunteer can choose 2 and more Hrs slot on Jan 1st. Every one is invited to come and participate to make this event a grand Success along with " Maa " Divine Blessings. Please Bring Maa Favourite Bhog to offer . Shri Sai Baba Maha Samadhi Punyathithi Festival 2015." Shirdi sai Baba Maha Samadhi oct 22, 24 Hrs Ramayan oct 17 and 18 , Laksharchana by 108 Ladies oct 16 , Navratri celebration oct 13-oct 22.
on Oct 22 Thursday & oct 17, 18th. As part of MahaSamadhi celebration Event we will also be doing 24 hrs. Ramayan on Oct17 and oct18. 24 Hrs. Ramayan Parayan (Akhand Ramayana) will start on Oct 17th Saturday Morning 9.00 am till Next Day Oct 18th Sunday 12 Noon followed by Maha Naivedyam. **Kakad, Madhyan,Dhoop and Shej Aarthi will be performed at their Regular time. Oct 17th, Saturday 9:00am : Starting 24 hrs. Ramayan Parayan until next Day Oct 18th 12 Noon. baba Maha Samadhi Celebration on Oct 22nd Thursday. Devotees can give their name and sponsor chandi path. Tuesday Oct 13th 6-8pm : Shailaputri Mata poojan, 108 naam, Havan, Katha, Bhajans, Arathi. Thursday Oct 22 nd 11:30am Dussehra pooja and aarthi. Sai Grand Maha Utsav " June 19th Friday, June 20th Saturday, June 21st Sunday." This is a Personal invitation to all Devotees of bay Area & Beyond to come and participate in this Grand Baba Event & take Divine baba Blessings . Its time for celebration , Its already 1 year , when we had baba Yantra sthapan pooja to the new prayer Hall , Now its time for the next step , which is baba Pranprathistha Pooja with free 5000 Baba Murthi Distribution and lot more activities planned as below..
Sai Grand Maha Utsav " June 19th Friday, June 20th Saturday, June 21st Sunday "
*** Free baba Murthi Distibution will be on Sunday June 21st from 8am -2pm, if there are more people , we will extend the time .Pls write your Name, phone and email at signup sheet in temple or send email to shirdisaisevak@yahoo.com. To Make this event more Memorable : We will be doing Sai Saptahik Parayan. June 14th Starting –June21st Ending. Friday June 19th :4th Year anniversary Day. 5) Small baba murthi pooja . Aarthi and Maha Prasadam . 2pm-6pm : Sai Sangeet cultural programs and Sai Ram Chanting . June 21st Sunday : Baba Pran prathistha and Free 5000 Baba Murthi Distribution to Everyone also 4th Year anniversary celebration. Baba Murthi Distribution to everyone . Aarthi , Sai Bhandara/ Maha Prasad . 2pm-6pm :Sai Sangeet cultural programs , sai bhajans and Sai Ram Chanting . Note : if you know any good singers , who can sing baba bhajans and do baba seva by doing 1 hr or 2 hrs Sangeet program either on June 20th saturday or sunday June 21st . Pls let us know . For more details pls send email : shirdisaisevak@yahoo.com . Shirdi Sai Darbar Sunnyvale Grand Baba Ram Navami Celebration Saturday March 28th , 2015. Shirdi Sai Darbar Grand Baba Ram Navami Celebrations. This is a personal invitation to all devotees of bay area and beyond to come and celebrate baba Ram Navami Function and make this event a grand success. Shri RamNavami Grand Celebration, Saturday March 28th with Baba Palki, Sai Bhandara & Sai Bhajans. This is a personal invitation for everyone to come and take divine blessing. Grand Maha Shiv Ratri Celebration on feb 16th 6am-Feb 17th 6am. Shirdi Sai Darbar @ 255 San Geronimo Way Sunnyvale , will be doing a Grand Celebration of Maha Shiv Ratri from feb 16th , 6am till feb 17th 6am. 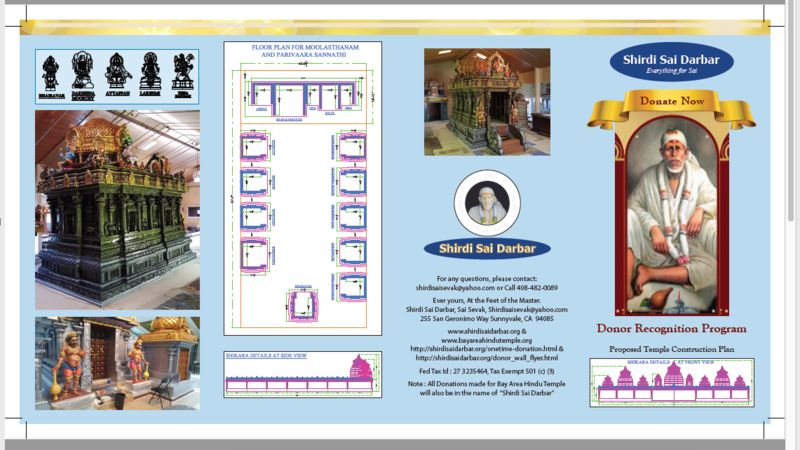 Everyone will get a chance to offer “ bhel patra leaves “ provided by the temple on the biggest shivlingam in the bay Area History , Don’t miss this chance .Its once in a Life time opportunity. Devotee can bring Ganga jal, Rose water, milk, flowers, vastra, Prasad for Shiva. We will be doing Alankaram,maha Abhishek, Rudram, Shiv tandav chanting and maha Mangal Aarthi on Feb 16th from 11pm-1am also. Sai Bhandara (Sai MahaPrasadam) On Jan 1st Thursday from 9.00 AM to 9.00 PM. take Baba’s blessings on New Year. 7:00AM - 7:45AM : “ Main Baba MurthiMaha Abhishek"